John F. Kennedy Space Center Americas gateway to the universe Spaceport News www.nasa.gov/centers/kennedy/news/snews/spnews_toc.html Jan. 22, 2010 Vol. 50, No. 2 Inside this issue . MIT students visit Heritage: ISS enters decade of research Page 7 Page 6 Page 6 Tornado season here Tranquility, cupola ready for place aboard ISS By Linda Herridge Spaceport News Sea turtle rescue Page 2 N ASAs Tranquility node soon will join the U.S. Destiny, Harmony and Unity modules on the International next month aboard space shuttle Endeavour on the STS-130 mission, NASAs last major piece of hard as they were tested and processed at Kennedys International Space Sta The European-built Tranquil ity was contracted to the European by prime contractor Thales Alenia node, which arrived at Kennedy in May 2009, was transferred to on Nov. 20, 2009. Kennedys International Space Directorate worked with the Ital and check out Tranquility and the cupola. Joe Delai, said the module contains about 1,068 pounds of crew and medical supplies, in crew trans platforms, for delivery to the space station. Tranquility contains miles of about 8,000 pounds more than a Delai said. Theres space for ad ditional racks, an exercise machine Deputy Director Bill Dowdell noted there was a problem with a to replace it. There were a lot of wires to Tranquility is very different the most complex module since the U.S. lab Destiny was prepared for used to connect Tranquility to the the stations prime contractor, will create a second set of hoses from Tranquility. had been used in the past for pro for the space station and had to be Delai said NASA, ESA and one team to build and check out the node. It is sad to see our European built a wonderful module that will said. will lead the six-member crew on STS-130. Terry Virts will serve Behnken, Kathryn Hire, Nicholas crew members will perform three spacewalks and use the shuttle and station robotic arms to attach Tranquility to the Unity node on the station. The cupola will be relocated Earth. The cupola will allow a nearEarth and space, and will be used as a control room for robotics and liv NASA/Jack Pfaller A technician dressed in clean room gear, typically called a bunny suit, stands by Tranquility, in the Space Station Processing Facility. SPACEPORT NEWS Page 3 Jan. 22, 2010 B stepped foot on the moon, NASA wanted to learn more about Earths closest celestial body. So, it sent probes and rovers to check out the conditions. The space before humans travel there. closer to the Martian surface. Lake Nona Middle/High School in Orange County: Team Mulrennan Middle School in Hillsborough County: Team study human factors with its experi Golden Gate High School in Collier County: sion operations with its experiment ments to send to the Mars Desert in March. is operated by The Mars Society. Each facility can simulate the envi encountered on the planet. closely examined the entries and who participated. It is obvious that teachers and students worked very with these innovative Mars experi before they are shipped to the facility. sults obtained from the experiments will have an opportunity to interact They also will take a virtual tour of Kennedy. School said, Perhaps most impor peers and mentors, and became Mars Experiment Design Competition focuses on teamwork NASA supports Educate to Innovate campaign Throughout the year, Kennedy will have more than 100 students and faculty from diverse fields seeking internship opportunities in the areas of science, technology, engineering and mathematics, as well as accounting and business. The External Relations Education Programs and University Research Division and the Human Resources Of fice need your expertise as mentors/colleagues for high school, undergraduate and graduate students, as well as postdoctoral scholars for the summer of 2010 through the spring of 2011. The experience will be rewarding for you, is essential to the success of the intern, and will help inspire Americas next generation or explorers. Mentor/Colleague and Projects Solicitation Forms will be available this month from your directorate administrative officer. For more information contact Benita Desuza at Benita.W.Desuza@nasa.gov or 321-867-3671 To learn more about education programs at Kennedy, visit www.nasa.gov/offices/education/centers/kennedy/ home/index.html Inspire next generation, become a mentor/colleague N ASA has launched an initiative to use its missions to boost summer underrepresented students across the nation. NASAs Summer of Innovation supports President Obamas Educate excellence in science, and mathematics, or STEM, education. into NASAs Summer of and Informal Education lead. We already have that educate Americas next unique place to further the work with thousands of middle school teachers and 2010. increase the number of future scientists, mathematicians participation of low-income, minority students. This is an incredible opportunity for our administration to come nations critical science, of Innovation, NASA is with federal, state, and local partners, universities and teachers to expand the opportunity for more of states, and partnerships with NASA will use its substantial Kennedys scientists and NASAs Summer of Innovation will increase the scope and scale of the STEM education Winterton, assistant administrator for education at NASA Headquarters. NASA content and products at the state level coupled and events open to students and teachers nationwide. The national event, in partnership with other departments and the availability of to competitively select district partnerships in up to seven states to pilot Awards will have a period of performance of 36 months. required to develop ways to keep students and teachers year and to track student participants performance NASA will use national network includes industry, museums, science centers, and state and local research and public outreach efforts for NASAs aeronautics and space projects. applications will be selected NASA has determined that submitters for this opportunity must be Space only one proposal per state will be accepted. Page 6 SPACEPORT NEWS Jan. 22, 2010 F normal winter severe weather weather season likely will start ear lier and could be more severe due to Ocean. more severe thunderstorms. that tornadoes will occur and the tornado to strike, it is much better to be prepared. Tornado safety is an easy, two-step process. Step 1, Have a Plan: Identify the safest room and ensure everyone there. The safest rooms typically are on the lowest floor with inside walls between you and the outside wall. Small rooms away from windows with solid construction, such as restrooms and closets, offer the best debris, and motorcycle and sports helmets can protect your head. People in mobile homes or other proper shelter elsewhere. A common myth is to open windows to let the not explode from decompression any loose outside materials and close protective shutters if there is Step 2, Keep Informed: Obtain formerly known as NOAA Weather NOAA radios even provide dont cover 2 percent of the country, so its important to test the reception of new radios. backup severe weather alerts. Some station Web sites send free text phones. You can even set different loud alarm. Some of these services specific locations so that you are you. The National Weather Service is Cold weather raises tornado threat; text alerts available By William P. Roeder 45th Weather Squadron You can view the 45th Weather Squadrons daily, 24-hour and weekly planning forecasts at: www.patrick.af.mil More info online Eight aerospace engineering students from the Massachusetts Institute of Technology peer into a Michelin tire used on a space shuttle flight during a recent tour of Kennedys Logistics Facility. NASA/ Troy Cryder E dents from the Massachusetts Institute of . and not just to enjoy the weather now that it has warmed up a bit. In fact, they prepped for months their three-week visit to the Sunshine State. Kwami Williams, Jillian introduced to the operation operations. erational Internship Experi the students to spend time requirements today. They also will understand how the relationship between the classroom, but critical for the successful practice ture . to what we can do. Its the best preparation we sphere of Kennedy could lead to summer employ ment and eventually new hires by NASA and Ken nedy aerospace contractors, future work force needs. fers NASA the opportunity to make a unique experi ence available to students summer, when the center Sponsored in part by Kennedys Education Of discussion with then-NASA to MIT in mid-November 2002. In January 2003, 12 ral visit. Since then, more than 50 students have been students receive introduc well as contractor opera space shuttle, International Space Station, payload and expendable launch vehicle Then, the students a more intimate familiar ates. Students will have the opportunity to interview Every day we see a different aspect of Kennedy blown away from every Williams said. what they learned will be required from all students at the end of their visit, Jan. 29. In the future, Ken nedy and the Massachusetts hope to expand this pro United States. 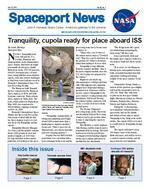 Page 8SPACEPORT NEWSJan. 22, 2010 John F. Kennedy Space CenterManaging editor . . . . . . . . . . . . . . . . . . Candrea Thomas Editor . . . . . . . . . . . . . . . . . . . . Frank Ochoa-Gonzales Copy editor . . . . . . . . . . . . . . . . . . . . Rebecca SpragueEditorial support provided by Abacus Technology Corp. Writers Group.NASA at KSC is on the Internet at www.nasa.gov/kennedy USGPO: 733-049/600142Spaceport News three weeks KSC-Spaceport-News@mail.nasa.gov The cold snap that lingered in Brevard County forced spaceport workers to focus on saving sea turtles. What did you do to brave the record chill?I couldnt ride my Harley . although my husband and I tried. I really didnt like the cold very much. I did cover up my plants. But I like the cold weather. It actually was quite refreshing.Maggie Forbes, with NASAWORD STREETON THE Christine Vanaman, with Innovative Health ApplicationsIve just been down here from New Jersey for only two years. My blood hasnt thinned out yet.Kevin Bivona, with ASRC Aerospace Corp.I put on everything I could underneath. Im from Puerto Rico and Ive never experienced this cold before.Emmanuel Navedo, with ASRC Aerospace Corp.I had to wake up an hour earlier to defrost my car. I hate cold weather . thats why I moved to Florida.Casey Booth, with NASA Exchange Looking up and ahead . Targeted for Feb. 7 Launch/KSC: Endeavour, STS-130; 4:39 a.m. EST No earlier than Feb. 9 Launch/CCAFS: Atlas V, SDO; 10:30 to 11:30 a.m. EST No earlier than March 1 Launch/CCAFS: Delta IV, GOES-P; Window 6:19 to 7:19 p.m. EST March 3 Launch/CCAFS: Falcon 9, Window 11 a.m. to 3 p.m. EST Targeted for March 18 Launch/KSC: Discovery, STS-131; 1:34 p.m. EDT Targeted for April 19 Launch/CCAFS: Atlas V, OTV; TBD Targeted for May 13 Launch/CCAFS: Delta IV, GPS IIF-1; 3:19 to 3:37 a.m. EDT Targeted for May 14 Launch/KSC: Atlantis, STS-132; 2:28 p.m. EDT Targeted for July 29 Launch/KSC: Endeavour, STS-134; 7:51 a.m. EDT Targeted for Sept. 16 Launch/KSC: Discovery, STS-133; 11:57 a.m. EDT No earlier than Nov. 22 Launch/VAFB: Taurus, Glory; TBD Targeted for December Launch/CCAFS: Delta IV, GPS IIF-2; TBD Aug. 5, 2011 Launch/CCAFS: Atlas V, Juno; TBD Aug. 15, 2011 Launch/Reagan Test Site: Atlas V, NuSTAR; TBD Sept. 8, 2011 Launch/CCAFS: Delta II Heavy, GRAIL; TBD To Be Determined Launch/VAFB: Delta II, Aquarius / SAC-D Satellite; TBD To Be Determined Launch/VAFS: Delta II, NPP; TBD No Earlier Than October 2011 Launch/CCAFS: Atlas V, Mars Science Laboratory; TBD NASA Employees of the Month: January NASAEmployees of the month for January are, from left: William Shockley, Procurement Office; Paul Jagdmann, Launch Services Program; Edsel Sanchez, Constellation Project Office; Robert Kline, Center Operations; Pamela Zeitler, Employee of the Quarter, Constellation Space Transportation Planning Office; Isolda Galiana-Liang, Information Technology and Communications Services; and Amy Simpson, Launch Vehicle Processing Directorate. Not pictured are, Peter Johnson, Engineering Directorate; James Broughton, Engineering Directorate; and Christopher Torres, Safety and Mission Assurance Directorate.